Tour highlights : Castle of Chambord, Martyr village of Oradour sur Glane, Gorges of Ardèche and Tarn, medieval villages of Rocamadour, St Cirq Lapopie, Viaduct of Millau, Unesco city of Avignon, ride to the Mt Ventoux. Pont du Gard 1st century Roman bridge. We will start our tour with the jewels of the Loire Valley: the castles of Amboise, Chaumont, Blois, Chambord, and finally, the most charming of all, Chenonceau. We will stop for the night in the medieval city of Loches with its castle of the Anjou Family, Chateau de Loches, and the Church of St Ours, dating from the 6th century. We will leave the Loire Valley and start heading toward the Limousin region following the river Gartempe. The landscape becomes more hilly but castles will still be part of our journey. We will stop at Oradour sur Glane, a martyr town completely destroyed by the Germans during WWII. Today it is a testimony of the brutality of war and one of the most moving sites to visit in all of France. On this day we will travel in the region with the highest number of villages with Heritage Landmarks, including Collonges la Rouge, and Turenne. We will spend the night in Sarlat, the capital of the Perigord region, and enjoy the rest of afternoon in the old town where gastronomy is raised in the old town where gastronomy is raised to an art from. Today is a free day dedicated to Sarlat and tis beautiful surroundings, including the medieval villages of Domme, la Roche Gageac, and Beynac, and also the sumptuous garden of Marqueyssac and the prehistoric valley of the Vézère River. One month would not be enough to enjoy all of the sights that abound. Be prepared for making choices of what to see and do. After a stop at the cliff-hanging village of Rocamadour, we will enter the curvy-roads region of Quercy and arrive in Cahors, famous for its fortified bridge of Valentré. On this day will visit a number of the Most Beautiful Villages of France (a government sponsored designation), including St Cirq Lapopie, Najac, Bruniquel, Cordes sur Ciel and more as the main course, topped off by a visit to the magnificient Unesco fortified cathedral of Albi for dessert. Today’s ride will take us to the Aveyron County, one of the most isolated parts of France. This is France’s Wild West. We will stop at the abbey of St Guilhem le Desert, and la Couvertoirade, a major Templar site. We will finally arrive in Millau for the night, sight of the Millau Viaduc, the highest suspended bridge in the word and a true engineering marvel. Be ready for curves, switch backs, and steep-walled gorges on this day’s breathtaking ride as we enter the National Parc of the Cevennes. We will descend the curves of La Malene and stop in Ste Enemie to recover over lunch. We will arrive at the gates of the Ardeche’s Gorges in Labeaume for the night. More curves and more beautiful spots to enjoy on a motorcycle as we male our way through the gorges that will lead us to Provence and the Unesco Papal Town of Avignon. 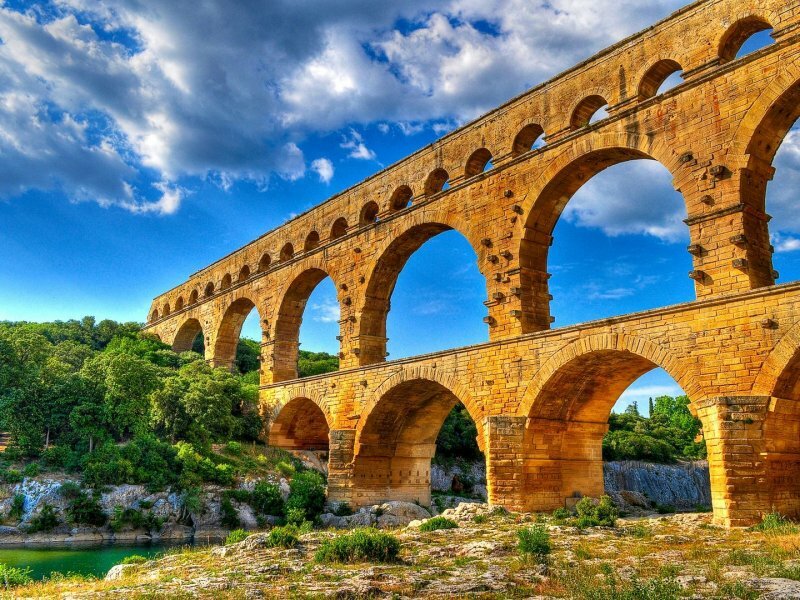 For the last day of our tour, those who want more riding can visit the Pont du Gard, a remarkably preserved Roman tree-level bridge, or ride the Mont Ventoux at 1,912 meters. Or you an simply enjoy the Avignon Old Town and its magnificent Palace Of the Popes. A farewell dinner in the Old Town will close the tour. Let the spirit of the south blow your way in this motorbike trip. Feel the charm of old stone, visit dozy villages at the foot of fortified castles and sample the culinary treasures of Perigord. From one corner to the other we will visit the old lands of France, in the heart of Provence. (*) optional : FREE !! enjoy 2 more days of free riding for those who choose to bring back the motorcycle to our office in Tours.